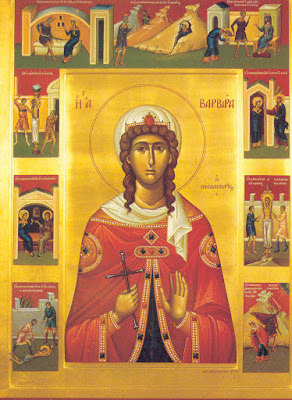 On the fourth of this month [December], we commemorate the Holy Great Martyr Barbara. Who was another Abraham, but of the devil. On the fourth Barbara was beheaded by the hands of her father. She lived during the reign of Emperor Maximian (286-305), and was the daughter of a Greek pagan. Hailing from the East, she was kept in a high tower, due to the beauty of her physical blossoming. Therefore this revered virgin was taught piety by God. Wherefore she revered Christ secretly, but she was unable to hide it from her impious father. He discovered this about her when he requested for two windows for the bath he had built, and the Saint instead requested for three windows, which happened. He then asked her, "For what reason did you have three windows constructed?" He learned from her, that she had them made in the name of the Father and of the Son and of the Holy Spirit. When this barbarian heard this, he set in motion to have her killed with his own sword. 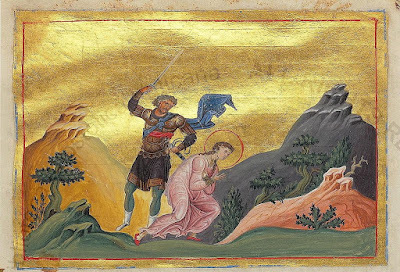 Because the Saint ran away, and upon leaving she entered into a rock, which in a strange manner split apart and received her, for this reason her father chased after her. When he found her, by means of an informer, he forcefully captured her by the hairs of her head. He then brought her and handed her over to the ruler of that land. The Saint confessed Christ before him, and she spoke ill against the idols. For this she was beaten harshly, and her flesh was torn and her sides were burnt. Then she was hit over the head with a hammer and stripped naked, and like this she was paraded around the city and beaten. Finally she was beheaded by the hands of her own father. Of him it is said, that upon slaying his daughter, and descending the mountain where this took place, he was struck by lightning from above. In this way his defiled soul departed. Let us praise holy Barbara who has broken the snares of the enemy. By the help of the weapon of the Cross she has escaped as a bird and flown Godwards. Great Martyr Barbara, you did follow Him Who is praised in Trinity, having abandoned the idols' shrines. You did strive in the midst of the arena, not shrinking from the tyrants' threats. You did cry out in a strong voice: I worship the Trinity, the One Divinity.